Curtis Malm hadn’t even been born when Bill Ogden won three straight Illinois PGA Match Play titles from 1970-72. That’s the last time any player scored a three-peat in the section’s first of four major championships. 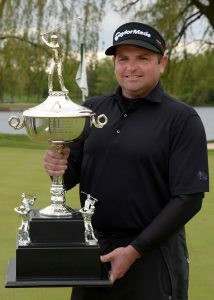 Malm ended that dryspell when he took a 1-up victory over Medinah teaching pro Travis Johns in the 63rd playing of the championship (MAY 12-15) at Kemper Lakes in Long Grove. The record for most consecutive wins in the tourney is still a ways off for Malm. Bob Harris, the only other player to three-eat, won six in a row in the 1950s. The IPGA Match Play tourney finally has a dominant player again following Curtis Malm’s three-peat at Kemper Lakes. Malm, though, was delighted with his third straight win and hopes to parlay it into a third straight IPGA player-of-the-year award. Only two other players have been three-peaters in the player of the year race – Hillcrest’s Steve Benson (1980-82) and Aurora’s Bob Ackerman (1987-89). Malm will also try to make history in the second major of the year, July’s Illinois Open at The Glen Club. He won that tournament as an amateur in 2000, and only three players have won that title as both an amateur and a pro. Rick Ten Broeck did it first, and in usual fashion. He was the champion as a pro in 1973 at Barrington Hills, then won again after regaining his amateur status in 1981. Gary Hallberg, the veteran tour player, was the winner as an amateur in 1977 and as a pro in 1982. Gary Pinns, who also played on the PGA Tour, took the Open as an amateur in 1978 and won it four more times as a pro (1985, 1986, 1988, 1990). Malm has some work to do before joining that select company but his latest Match Play victory was special, in that it came in his first major since becoming head professional at White Eagle in Naperville. He was an assistant at St. Charles Country Club the previous two years, and he anticipated a tough task in his three-peat bid. He came through by winning six matches over four days, the last two in cold (40-degree temperatures), windy weather and occasional rain. He had Mistwood teaching pro Chris Ioriatti 4-down with four holes to play in the morning semifinals on the final day, but Ioriatti won the next three holes before Malm closed him out on the 18th. “Way more drama than I wanted,’’ Malm admitted. But more was to come in the title match against Johns, the tourney’s 2010 champion. Johns was 2-up after eight holes, but Malm fought back and their duel was all square at the 18th tee. Both players hit solid drives and good approaches on the par-4, Johns’ stopping 18 feet from the cup and Malm’s 12 feet. After John’s left-to-right breaker barely missed Malm knocked in the winner. Johns also had a tense semifinal match. He holed two shots from off the green to force extra holes against Conway Farms’ new head pro, Matt Slowinski, but needed a 12-footer on the second hole of sudden death go earn his berth in the final.